The subtle variation in color and implied movement of Anne Lindberg’s drawings challenge our perception and invite us in for a closer inspection of the work. 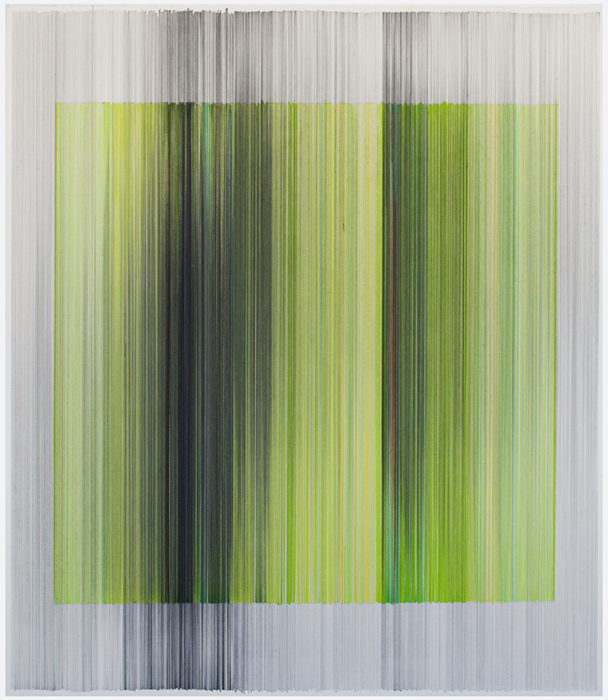 The New York artist develops this sense of motion through her time-intensive process of drawing narrow bands of graphite and color pencil with barely recognizable individual variations in the intensity and density of the line. The placement of the lines suggests speed and frequencies, elements that she associates with human perceptions and our primal interactions with the natural world. Lindberg has exhibited her two-dimensional works and ethereal thread installations across the US.